What is Relative Humidity, Dew Point, & Dehumidification? Digital control. A SaniDry® basement dehumidifier and air-cleaning system includes a built-in humidistat that allows you to set a target humidity level for the appliance to achieve. Humidity refers to the amount of moisture that's contained in the air. Whenever we talk about "humidity," we usually mean "relative humidity" - the amount of moisture the air contains compared to the maximum amount the air could hold at a specific temperature. As air temperature increases, so does the amount of moisture in the air. People tend to feel most comfortable in the 45% RH range. Low RH (25% or less) increases static electricity in the home. It also has adverse health effects: sinus problems, dry eyes, dry skin, bronchitis. Indoor air that's too "dry" is more likely to occur in wintertime, when heating systems dry out the air. 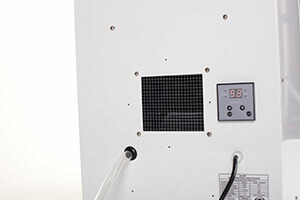 High humidity (above 50%) encourages the growth of mold and bacteria and also attracts dust mites. These organisms can cause health problems. Mold can ruin organic materials and eventually lead to wood rot. High humidity is more likely to be an issue in summertime, however your air conditioning system dehumidifies the air as it cools it. High humidity problems are often confined to moist areas of the house, such as bathrooms, kitchens, basemenst and crawl spaces. Moisture condenses out of the air when the air temperature dew point is reached. When you take a hot shower, water droplets on the bathroom mirror or window indicate that moist, interior air has reached its dew point near these cool surfaces. Dehumidification tends to be more important than humidification in most homes. That's because our daily indoor activities (showering, washing clothes, cooking, watering indoor plants, etc.) tend to increase indoor humidity. There's usually more of a problem with excess humidity that causes mold and mildew. Basements and crawl spaces are common target areas for dehumidification. Even when these spaces seem dry, soil moisture can continually permeate through the foundation and floor slab if the ground outside is wet. When moist air condenses on cooler surfaces in a basement or crawl space, wetness accumulates and creates ideal living conditions for mold, mildew and dust mites. Two ways to combat excess humidity problems are to air-seal crawl spaces and basements, and to run a dehumidifier designed to work well in these areas. Learn about dehumidification and solutions that will keep your basement, crawl space, and other areas of your home dry and healthy.